Download "Psychology Professor Joe W. Hatcher; Associate Professor Kristine A. Kovack-Lesh (Chair) Visiting Professor Jason M. Cowell"
3 behavior, and the physiological basis of behavior. Class includes occasional laboratory demonstrations and independently designed student projects Advanced Tutorial Staff Variable credit course, 1-3 credits. An opportunity for students to perform independent work on a topic of interest under the supervision of a faculty member. Counts toward the maximum number of credits allowed for independent study. Prerequisites: consent of the department chair and the faculty tutor Topics in Psychology Staff Variable credit course, 1-4 credits. 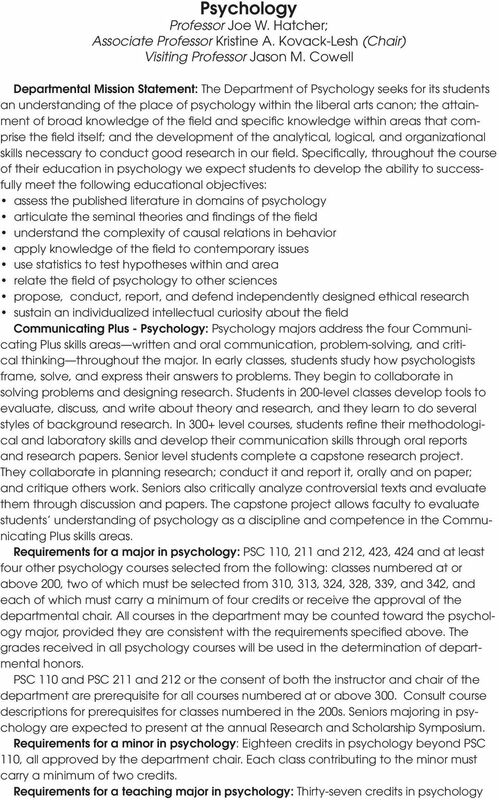 Special topics in psychology not covered by regular courses. This course may be repeated for credit when topics change. Please see the pertinent Schedule of Courses for the listing of topics courses and possible prerequisites. Prerequisite: PSC Practicum in Clinical/Counseling Psychology Hatcher Variable credit course, 1-2 credits. Students will participate in on-site experiences relevant to Clinical/Counseling Psychology. Weekly logs and a final paper are required. Repeatable to a maximum total of four credits. Grading is S-U. Prerequisites or corequisites: PSC 110 and consent of instructor. 211, 212. Research Design and Statistics Staff Four credits each semester. A two-semester sequence which integrates methods of data description and statistical inference with methods of designing and conducting valid and reliable research projects ranging from naturalistic observations to experiments. Lectures and laboratory. An independently designed experiment is conducted and reported each semester. Completion of PSC 211 is expected prior to enrollment in PSC 212. Prerequisite: PSC Psychopathology Hatcher Description and analysis of causative factors (both psychological and biological), symptoms, and therapeutic measures taken with respect to various patterns of deviant behavior. Students learn to diagnose by examining and discussing published cases. Prerequisite: PSC Theories of Personality and Counseling Hatcher This course examines the major theories of personality and, where possible, the counseling traditions associated with them. Major theories covered include biological, Freudian and neo-freudian, behavioral and cognitive-behavioral, and humanistic. Therapeutic approaches arising from these views are examined with the help of class role-play and video resources. The interaction between culture and personality are also explored. Prerequisite: PSC History and Systems of Psychology Staff A survey of Western psychology from its origins in Greek philosophy and biology to the present. The more significant movements, schools, and systems within psychology are considered and their interrelationships discussed. Prerequisite: PSC 110. 4 234. Infant Development Kovack-Lesh This course explores development in the first two years of life. Topics such as prenatal development, early perceptual and cognitive development, development of emotional expression and recognition, and early development of social bonds and interactions are examined. Emphasis is placed on theories of infant development and the validity of research evidence. The course format included lectures and discussions. Prerequisite: PSC Child Development Kovack-Lesh A survey of research and theoretical literature dealing with the development of the human organism from conception to the onset of adolescence. Emphasis is placed on physical, motor, perceptual, language, cognitive, personality, and social development. Prerequisite: PSC Adolescence Kovack-Lesh Developmental processes associated with the period of adolescence. Emphasis is placed on physical, cognitive, personality, and social changes. Prerequisite: PSC Departmental Studies Staff Variable credit course, 1-4 credits. 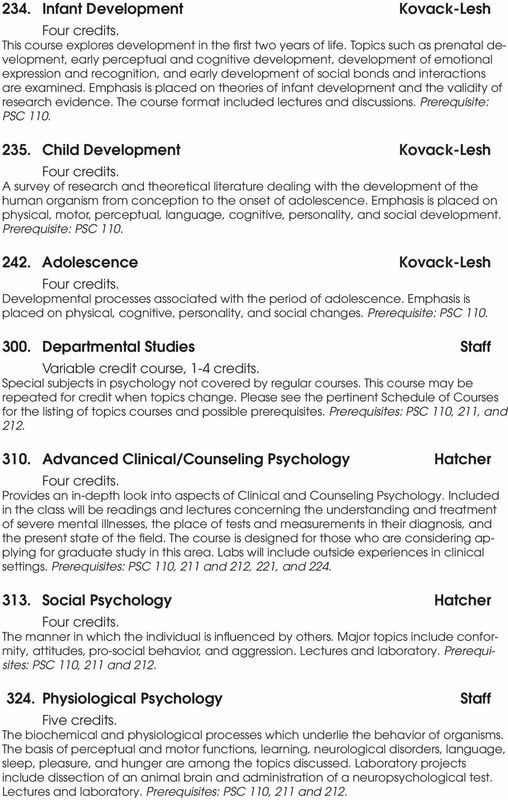 Special subjects in psychology not covered by regular courses. This course may be repeated for credit when topics change. Please see the pertinent Schedule of Courses for the listing of topics courses and possible prerequisites. Prerequisites: PSC 110, 211, and Advanced Clinical/Counseling Psychology Hatcher Provides an in-depth look into aspects of Clinical and Counseling Psychology. Included in the class will be readings and lectures concerning the understanding and treatment of severe mental illnesses, the place of tests and measurements in their diagnosis, and the present state of the field. The course is designed for those who are considering applying for graduate study in this area. Labs will include outside experiences in clinical settings. 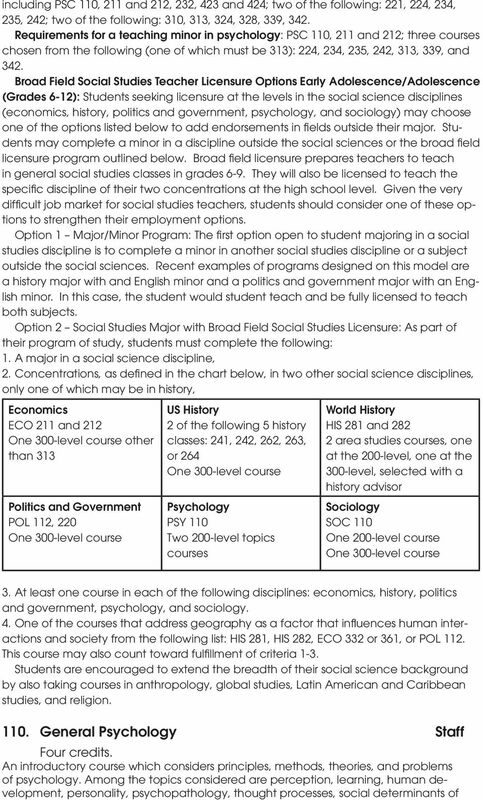 Prerequisites: PSC 110, 211 and 212, 221, and Social Psychology Hatcher The manner in which the individual is influenced by others. Major topics include conformity, attitudes, pro-social behavior, and aggression. Lectures and laboratory. 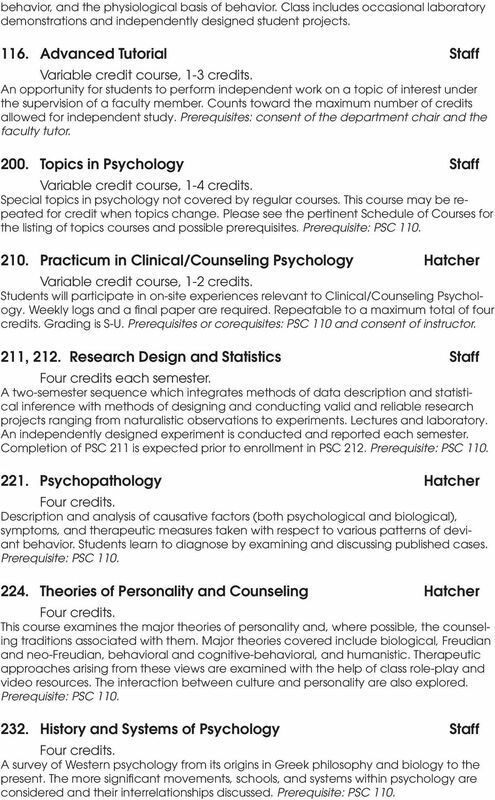 Prerequisites: PSC 110, 211 and Physiological Psychology Staff Five credits. The biochemical and physiological processes which underlie the behavior of organisms. The basis of perceptual and motor functions, learning, neurological disorders, language, sleep, pleasure, and hunger are among the topics discussed. Laboratory projects include dissection of an animal brain and administration of a neuropsychological test. Lectures and laboratory. Prerequisites: PSC 110, 211 and 212. 5 328. Sensation and Perception Staff An examination of the means by which organisms come to represent their environments perceptually. Topics include sensory systems, perceptual coding, perceptual illusions, tests for visual and auditory disabilities, and perceptual development. Laboratories include direct investigation of perceptual phenomena. Prerequisites: PSC 110, 211 and Cognitive Processes Kovack-Lesh An examination of the bases of human thought. Topics include attention, varieties of memory, concept formation, executive processes, problem solving, decision making, and language. Lectures and laboratory. Prerequisites: PSC 110, 211 and Cognitive Neuroscience Staff An introduction to the theories, methods, and findings of the interdisciplinary field known as cognitive neuroscience. Both behavioral research and studies of brain activity informs topics such as selective attention, language, cerebral lateralization, perceptual functions, motor control, executive functions and consciousness. Laboratories will focus on cognitive and perceptual processes. Lectures and laboratory. 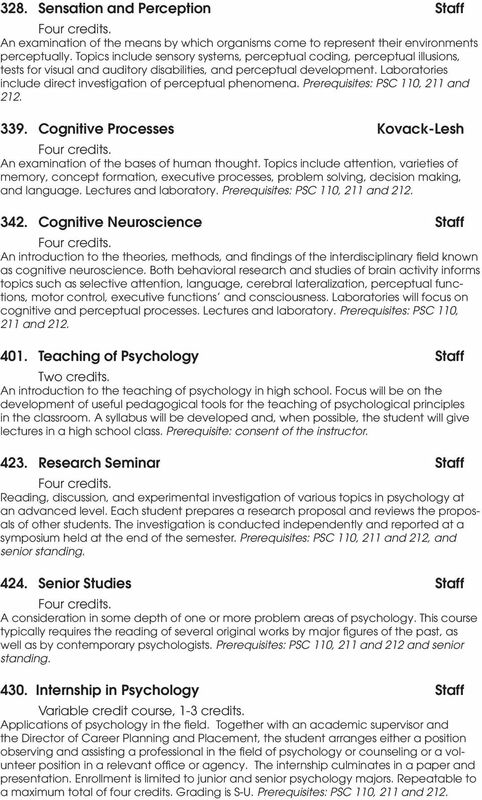 Prerequisites: PSC 110, 211 and Teaching of Psychology Staff Two credits. An introduction to the teaching of psychology in high school. Focus will be on the development of useful pedagogical tools for the teaching of psychological principles in the classroom. A syllabus will be developed and, when possible, the student will give lectures in a high school class. Prerequisite: consent of the instructor Research Seminar Staff Reading, discussion, and experimental investigation of various topics in psychology at an advanced level. Each student prepares a research proposal and reviews the proposals of other students. The investigation is conducted independently and reported at a symposium held at the end of the semester. Prerequisites: PSC 110, 211 and 212, and senior standing Senior Studies Staff A consideration in some depth of one or more problem areas of psychology. This course typically requires the reading of several original works by major figures of the past, as well as by contemporary psychologists. Prerequisites: PSC 110, 211 and 212 and senior standing Internship in Psychology Staff Variable credit course, 1-3 credits. Applications of psychology in the field. Together with an academic supervisor and the Director of Career Planning and Placement, the student arranges either a position observing and assisting a professional in the field of psychology or counseling or a volunteer position in a relevant office or agency. The internship culminates in a paper and presentation. Enrollment is limited to junior and senior psychology majors. Repeatable to a maximum total of four credits. Grading is S-U. Prerequisites: PSC 110, 211 and 212. 6 435. Field Studies in Child Development Kovack-Lesh Variable credit course, 1-2 credits. Organization and execution of observational studies of children in a variety of nonlaboratory settings, including day care centers. Focus will be on the use of field research methods to study principles of child development, including language, emotional, cognitive, social and moral development. Students will meet regularly with the instructor. Prerequisites: PSC 110, 235 and consent of the instructor. 541, 542. Independent Study Staff Variable credit course, 1-4 credits each semester. Experimental investigations of an original nature performed in consultation with the instructor. The experiments are reported in formally prepared papers. No more than twelve credit hours of independent study or internship may be taken, and no more than eight credit hours may be in one department. A registration form is required. Prerequisites: PSC 110, 211 and 212, junior or senior standing, consent of the department chair and a department project director, and 12 credits toward the major. Business Management Professor Mary Avery (Director); Associate Professors Peng Huang, Anne-Christine Barthel; Instructor Thomas M.
Prerequisite: Psychology 1 or 9 or junior or senior standing. Dr V. J. Brown. Neuroscience (see Biomedical Sciences) History, Philosophy, Social Anthropology, Theological Studies.